The landscape may have turned white again with the latest snowfall, but the birds are starting to show some color at last, with the males molting some of their body feathers. 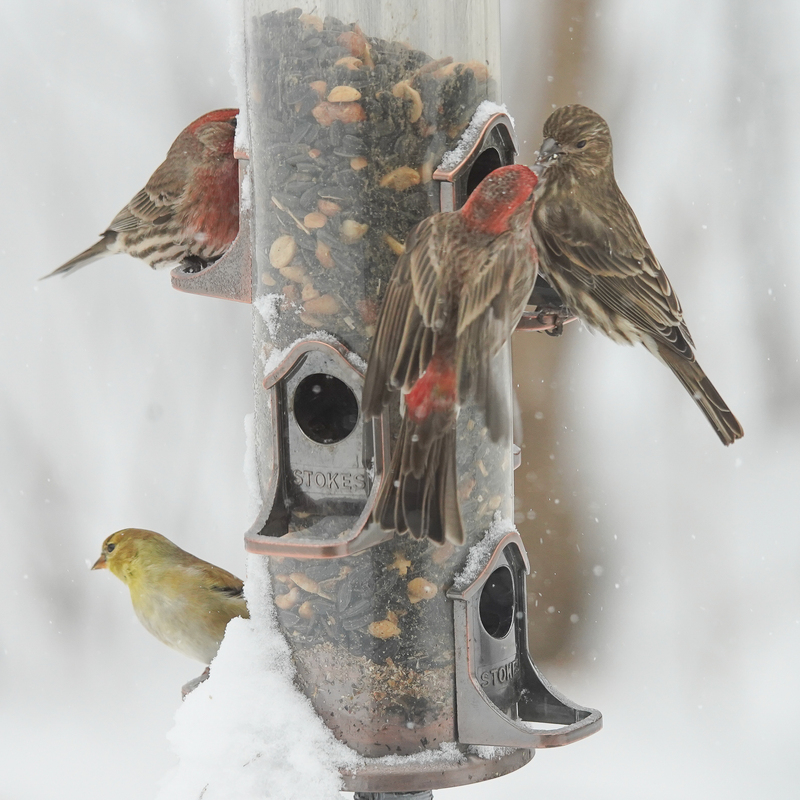 I don’t think I’ve ever noticed the pretty red rump of the male House Finch in its breeding plumage. Not quite ready for prime time yet, but the male American Goldfinches are starting to sprout new yellow feathers in place of their drab tan winter plumage. 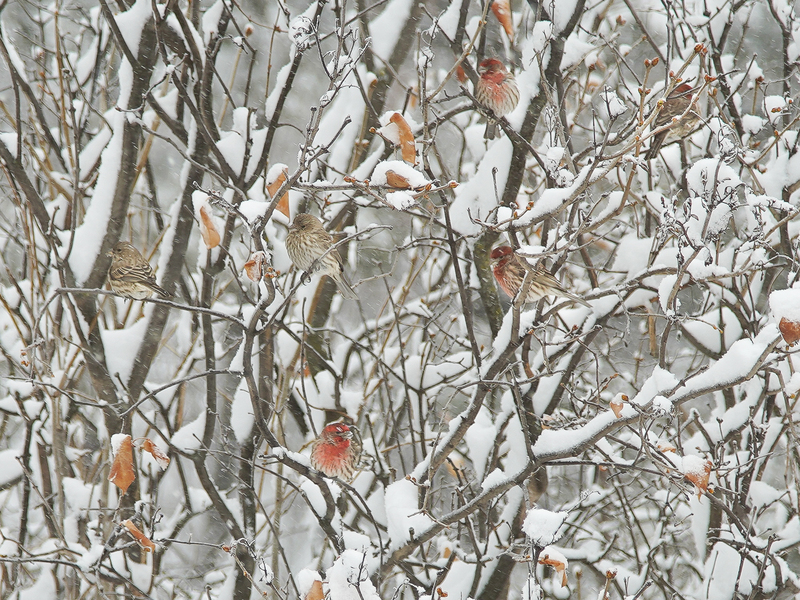 Cardinals, Chickadees, and Finches are singing — spring is on its way, if very slowly. Even the Cardinals have yet to lose the gray edging of their bright red feathers before they gain their true spring brilliance. There is quite a banquet of tasty choices for seed-eaters in the backyard these days, with all the wildflowers trying to set seed. 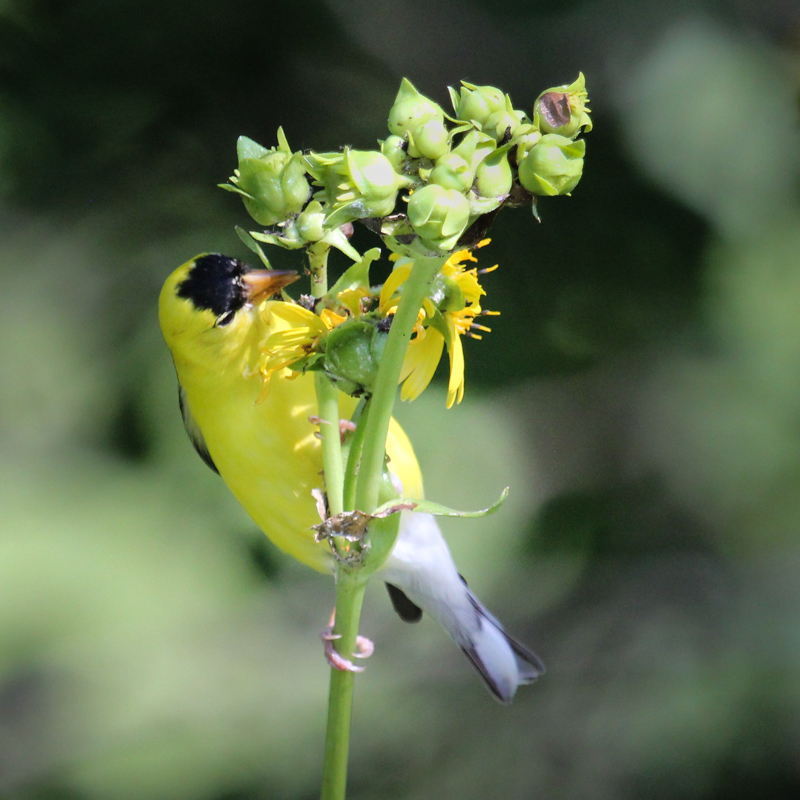 Goldfinches have been attacking the seed heads of the cup plant, tugging forcefully to loosen the seeds that are packed into a dense head. 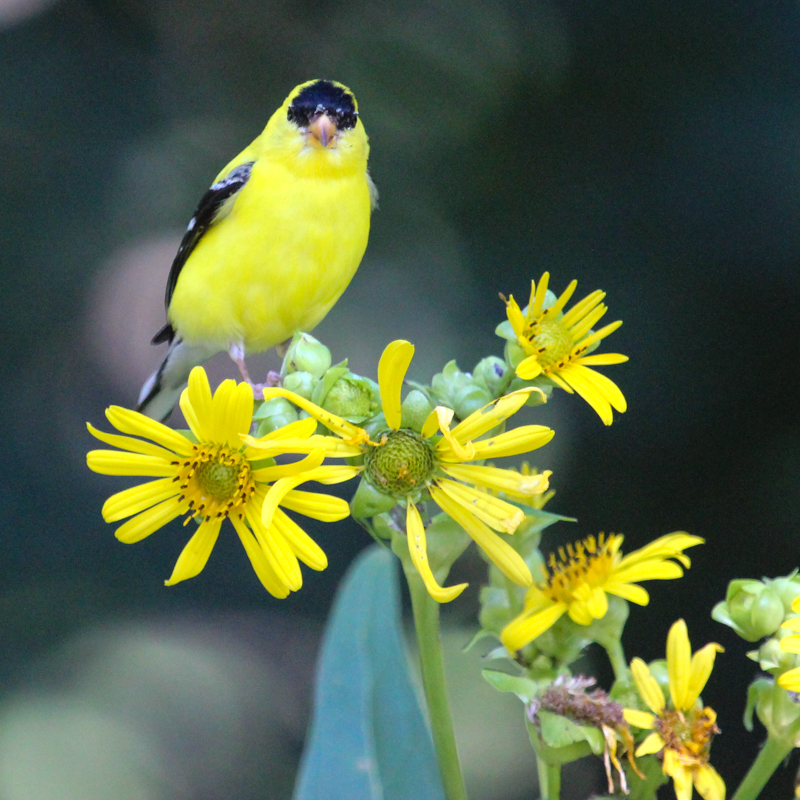 More than a dozen male Goldfinches chirped and chittered as they tore into the plants. Apparently it takes quite a bit of tugging force to dislodge the seeds packed tightly into cup plant seed heads. The technique is simply to tear off the outer leafy material exposing the seeds within. Got it out, now what? The bird turned the seed around and around in its mouth, like it was tasting it, and then dropped it and went on to another seed head. Maybe this one wasn’t ripe enough? 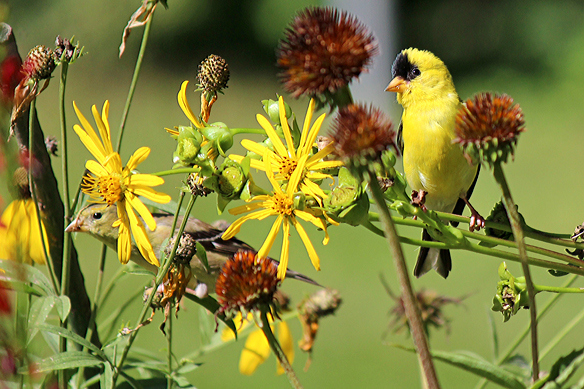 Other male Goldfinches explored the seed heads of the bee balm (Monarda). There is a good crop of these in the backyard as well, and each seed head produces a lot of seed. And of course there is coneflower seed for dessert. Spring is a time of change in many ways. Over the past couple of weeks, I’ve watched the goldfinches (males, mostly) transform from the drab tan and gray winter plumage into their bright, golden, summer one. This male is just beginning the molt. 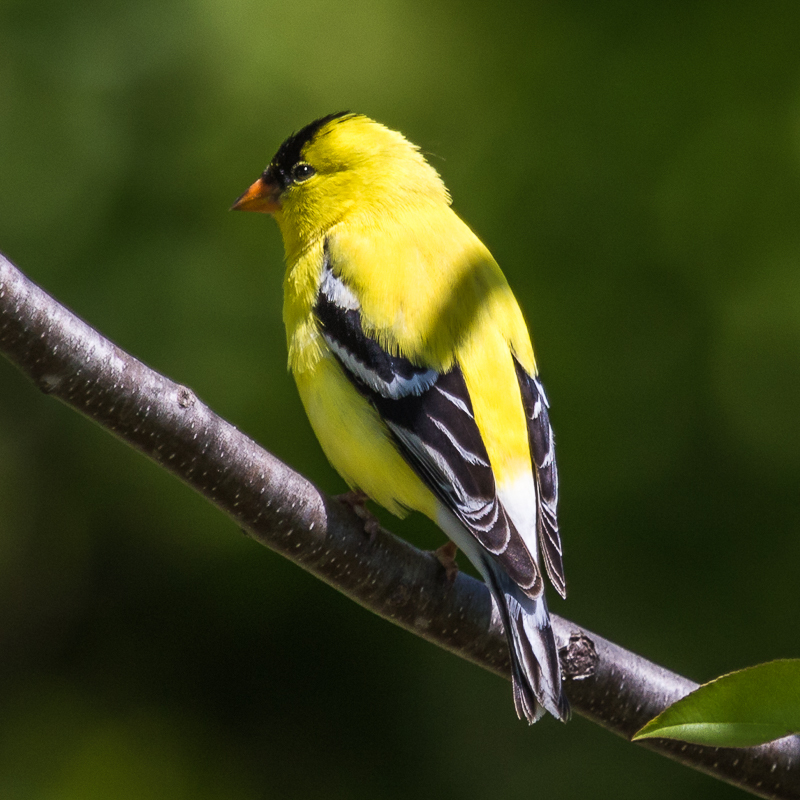 The process is rather gradual — growing feathers is an expensive and time-consuming process — and consequently, male Goldfinches in the spring exhibit variegated colors. The black feathers on the head are still coming in, but the body feather molt is almost complete on this male. Like many songbirds, Goldfinches undergo two feather molts annually: a complete body, wing, and tail molt in the fall, and a partial molt of just body feathers in the spring before breeding. Spring molt complete, this handsome fellow is ready for action. The yellow color comes from dietary carotenoid pigments, which must be consumed while the feathers are coming in. (Read more about pigment coloration in birds here.) 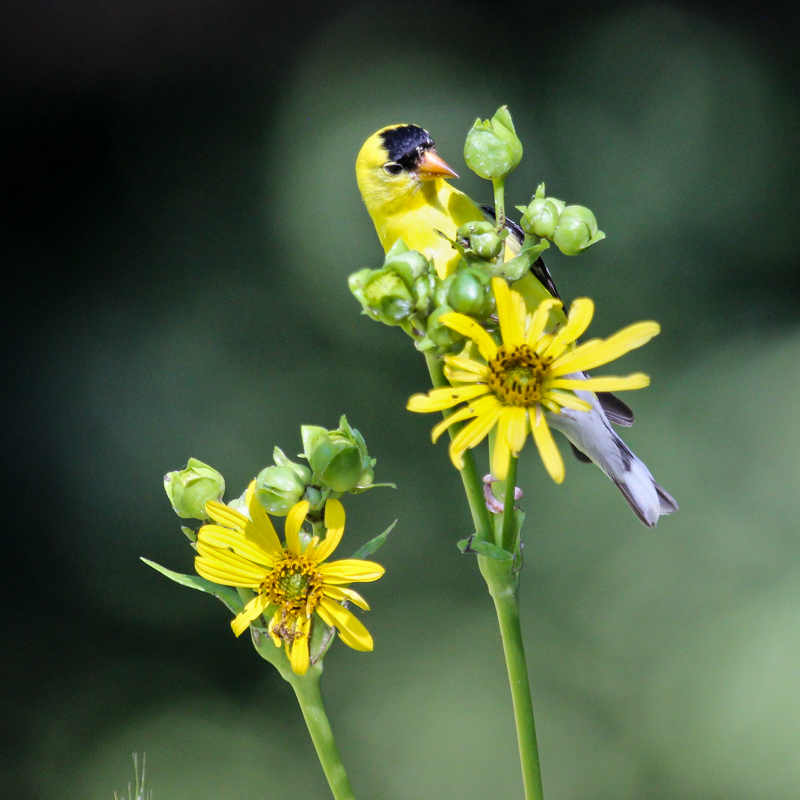 Millet seed provides much higher concentrations of carotenoids than sunflower and thistle seed (which are quite low), so perhaps Goldfinches change their diet slightly in the spring to increase their carotenoid uptake. Studies have shown that the male Goldfinches that are brightest in color are the most successful in attracting a mate and have the highest levels of carotenoids circulating in their blood, which might be attributed to their greater success in seeking out the appropriate food sources. Even though I’ve just read that 2015 was the hottest year in historical weather record-keeping (2 degrees F above average world annual temperature), the backyard here is buried in the deep freeze. Several of my fellow bloggers have been posting queries about how animals survive conditions like this in the wild — or how humans who live and work outdoors all winter survive these extremes. So, being somewhat of an expert on this topic once upon a time, I’m going to try to explain how they do it. Who ordered this sleety, icy rain? But Slate-colored Juncos are tough, and they outlast this kind of inclement weather. where’s the food? Summer production is long past, food is buried under snow, other animals got to it first — so how does a warm-blooded animal get enough energy daily to fuel the heat-producing furnace? Really, there isn’t much here to fuel the needs of a large-bodied animal like these White-tailed Deer. 1. Prepare for it: Those chilly fall mornings and waning daylength are signals that challenging days are ahead. Animals prepare for the challenges of winter by hoarding or stashing food in places where they can find it later. 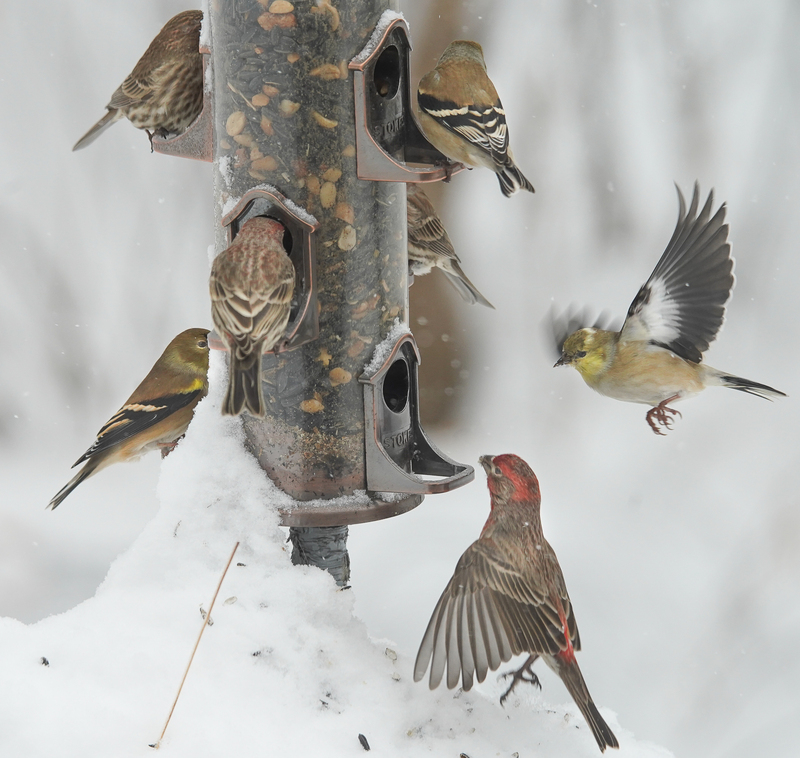 Usually, there is a flurry of activity at bird feeders as birds and squirrels take seeds to their winter roosting sites. Packing those cheek pouches full, a chipmunk carries his prize underground to eat later. And — a new set of freshly molted feathers in the fall not only disguises once brightly colored birds, but provides a nice, new downy coat of insulation. An under coat of dense fur beneath longer guard hairs helps keep mammals warm in the winter. 2. Eat like crazy — in order to put on a nice layer of fat reserves. This strategy works better if you’re a fleet-footed mammal, because when birds put on too much fat, they can’t fly. In addition to the insulative value of a layer of fat, it does provide an energy reserve for overnight energy expenses and the days when foraging for food was inadequate. 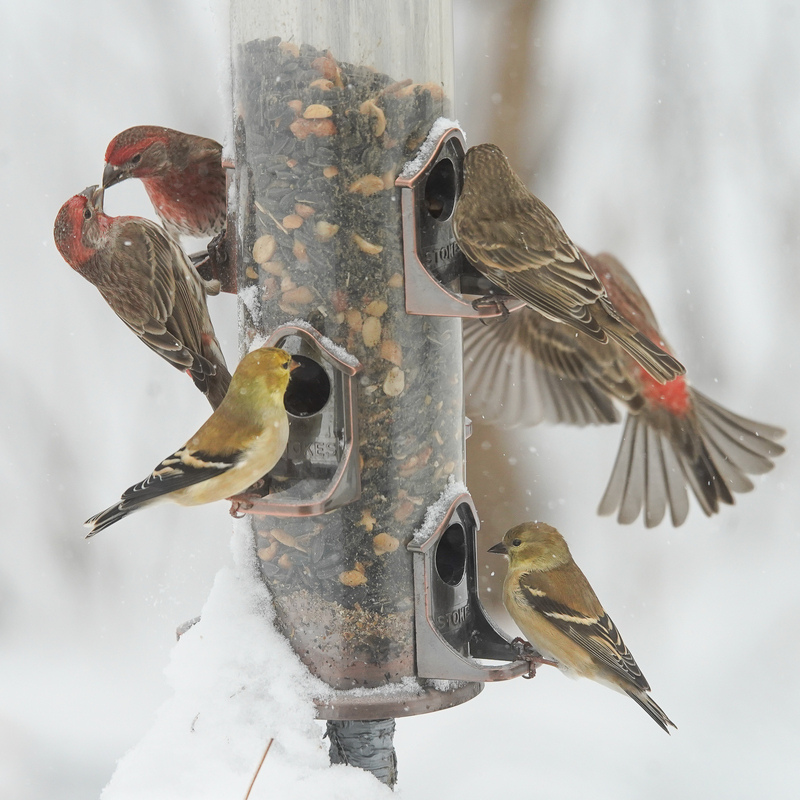 Dining with friends (House Finches) is always a good idea, so that many eyes can spot the skulking predators. 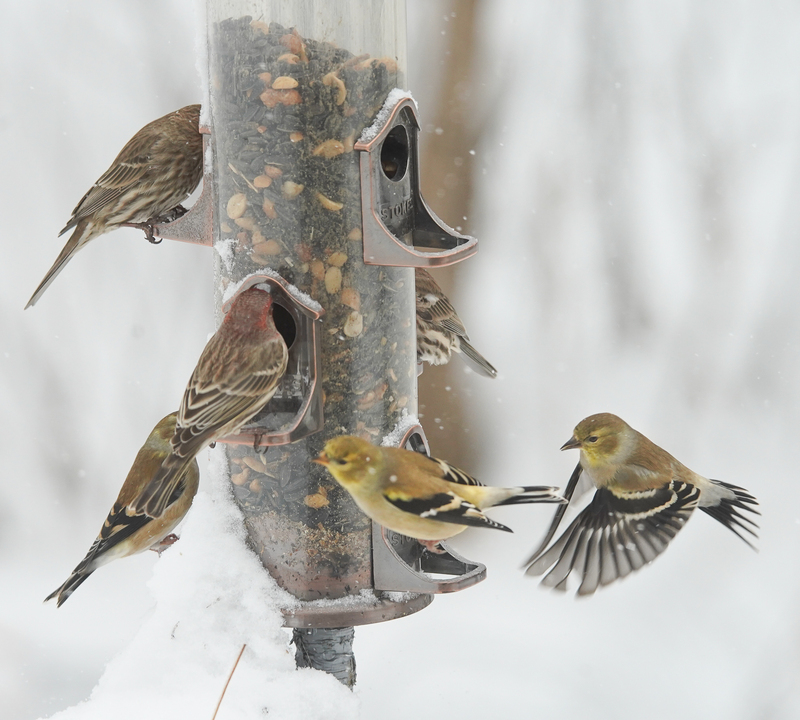 Pine Siskins are so good at searching out and consuming high volumes of seed per day that they can maintain their body temperatures, even at very low extremes. 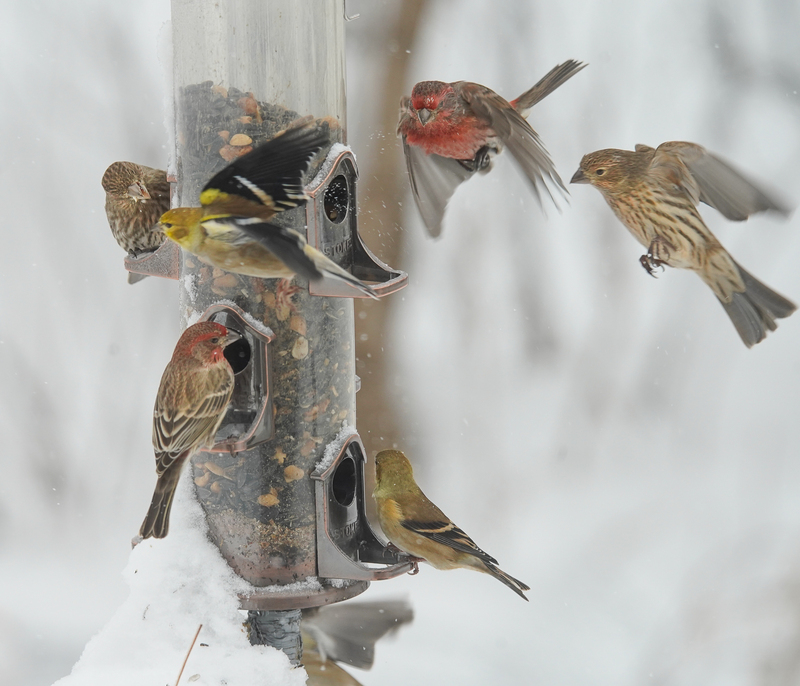 Like Common Redpolls, these little birds are champions at cranking up the metabolic furnace to generate heat. And — since there aren’t many insects active in the winter, avian insectivores like chickadees switch their diet to take advantage of the high-energy content in seeds. Do you wonder how a bird that weighs less than a McDonald’s ketchup packet stays warm in sub-zero cold weather? 3. Hide from the worst extremes: Chickadees, nuthatches, and woodpeckers find a refuge from extreme temperature and wind in a roost hole. Some sparrows and larger birds like Robins and Blue Jays huddle in the thickest part of evergreen vegetation which protects them from the effects of wind and precipitation. Many mammals retreat to underground burrows, tree cavities, or leafy nests to hide from extremes. To be continued tomorrow with more solutions…. 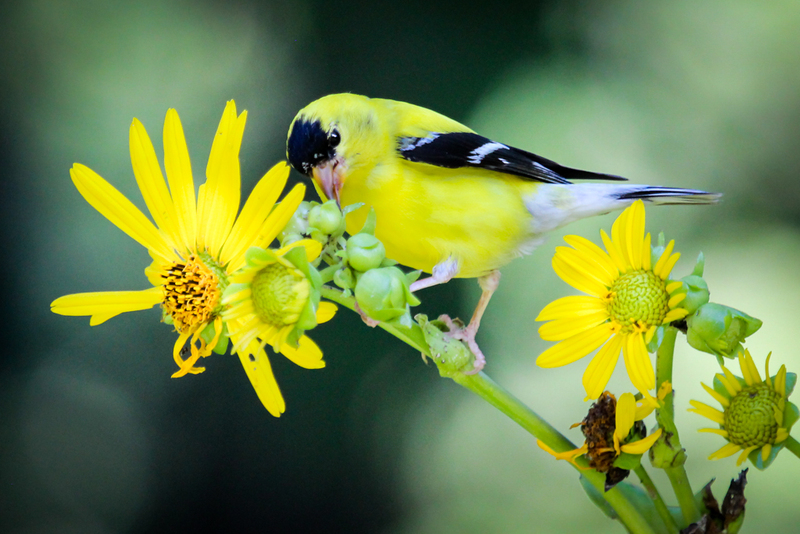 “Goldfinches are among the strictest vegetarians in the bird world, selecting an entirely vegetable diet and only inadvertently swallowing an occasional insect.” (says the Cornell Lab of Ornithology — about the diet of the American Goldfinch.) In fact, (the Cornell website suggests), cowbird chicks that hatch in a Goldfinch nest often starve presumably because they can’t digest the highly vegetable diet the parents bring to their own young. I often observe Goldfinches foraging in the flowers of the Cup Plant, which form a 7-8 foot tall border on one side of my wildflower garden. I always assumed they were harvesting seeds from the spent flower heads, but that was definitely not the case for one Goldfinch that I watched. 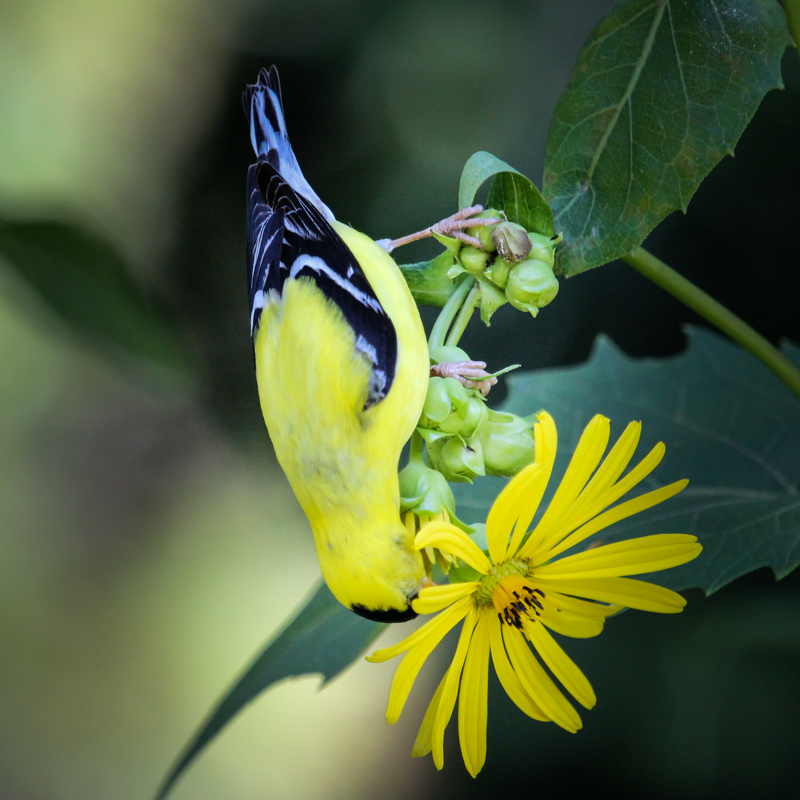 A male American Goldfinch spent many minutes probing the bases of unopened flower heads in the Cup Plants. The bird examined the base of the unopened flowers closely. Sometimes I could see tiny spiders or ants crawling around, perhaps trying to avoid being ingested by the bird. It sure looks like this bird is about to ingest one. The bird went to great lengths to check out those unopened flowers. All this attention to this particular place on the flowering stem must mean there were some hidden treasures there. So I pulled apart a few of those flower heads myself, and discovered a treasure trove of insect material. Ants, spiders, tiny mites, and…a web of plant material covering a 1/2 inch long larva right at the base of the unopened flowers. This might be unusual behavior for a Goldfinch to harvest insects in this way, but it would certainly be beneficial to provide a little animal protein for their rapidly growing offspring. Perhaps, the “inadvertent swallowing of insects” isn’t really so inadvertent as was once assumed. I carried the big telephoto around for several hours yesterday, visiting several locations at which I had previously seen quite a few warblers, but I came up with a very short list of birds. 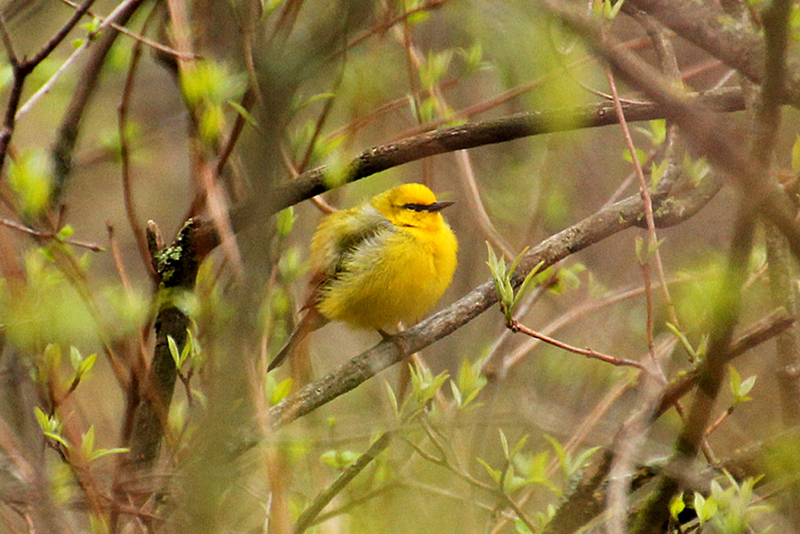 The resident orioles, song sparrows, goldfinches, cardinals, and even catbirds were quite obliging — all singing away, but the warblers (except one you’ll see below) were sadly absent. And yes, this was a particularly handsome male Yellow Warbler, who is looking a bit chubby from those fluffed out feathers. It was a cold. windy morning. 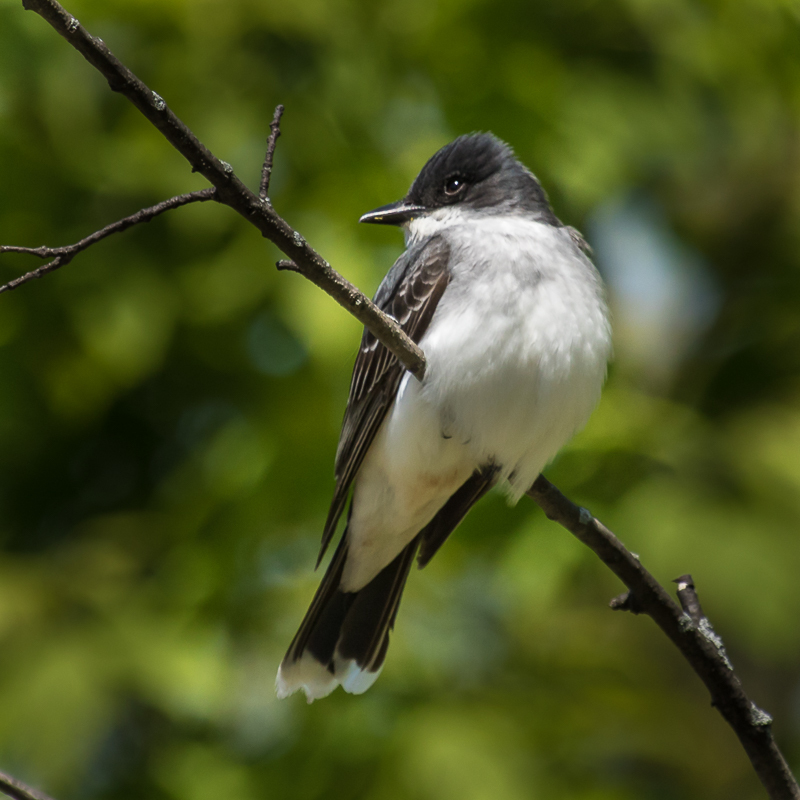 The Squawker was an Eastern Kingbird, who sat on an eye level branch about 50 feet away, giving me the once over. But the bird was not shy about diving after an insect or two and then returning to exactly the same branch. I took at least 20 nice photos, but only one in which the bird opened its mouth to give its characteristic buzz-squawk call. 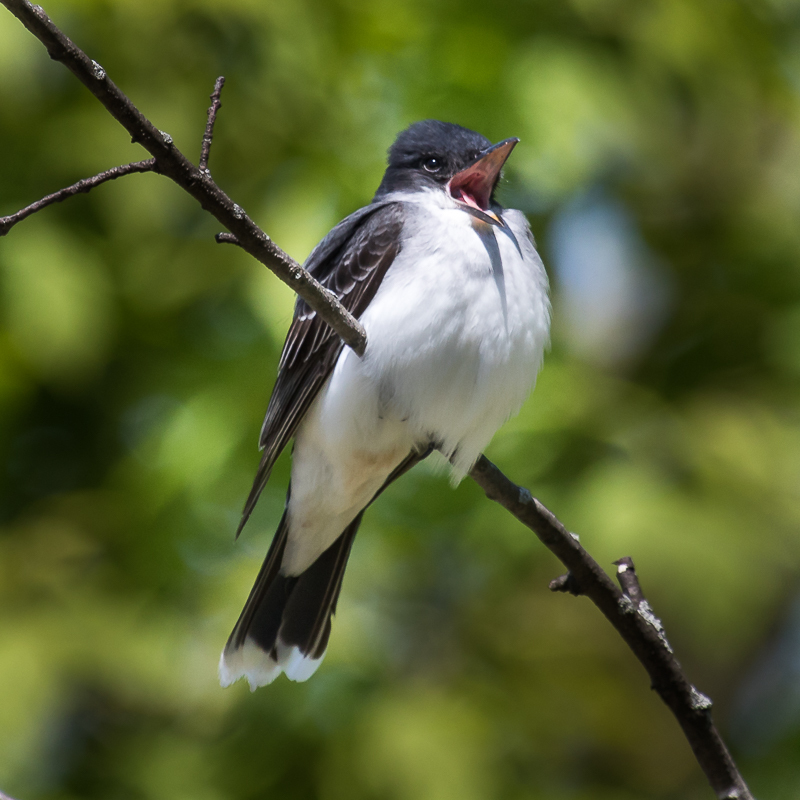 The Cornell Lab of Ornithology has several recordings of the pleasant songs Kingbirds sing — but perhaps this was a female, or a non-territorial male. “buzz-squawk” — feathers all fluffed out to keep warm, even tucking them over its bare toes. Good looking in any position. American Goldfinches males are usually vociferous singers, loudly proclaiming their breeding status to all around them. I must have gotten too close, because he half-turned, looked shyly away from me, and then made a dive for cover in the nearby bushes. This bird had nothing to say — he was all looks and no voice. 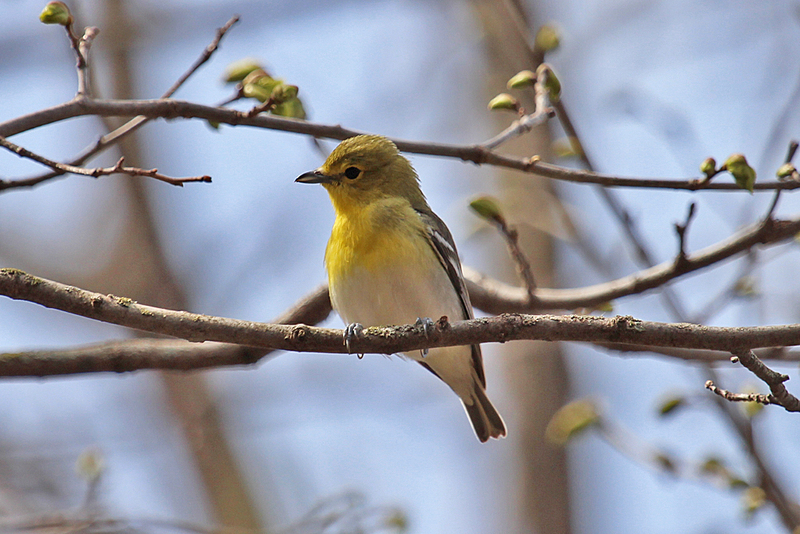 Better luck next year…maybe the warblers will stop in for a day or two then. 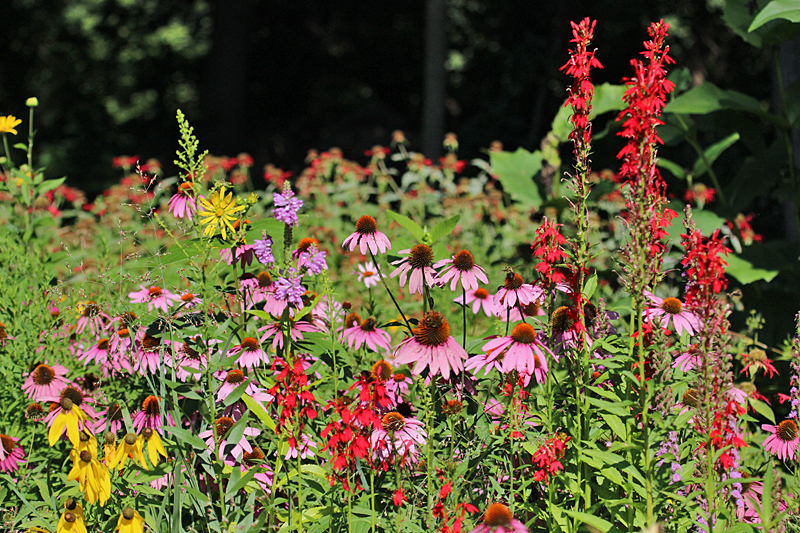 The wildflower garden was really “humming” with activity this morning. Perfect weather combined with maximum bloom of the wildflowers has drawn a variety of wildlife in. The scene on a mid-August (feels like fall) morning. You can’t see them in this photo, but there are dozens of bees, mostly bumblebees, working the flowers. 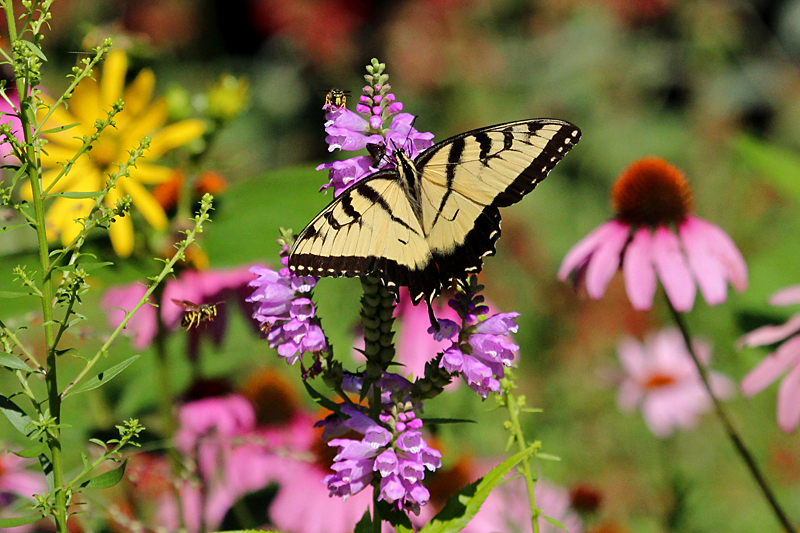 At least two and possibly three Tiger Swallowtail butterflies roam the various flowers looking for the best nectar supplies. This one seemed to enjoy the Obedient plant nectar. 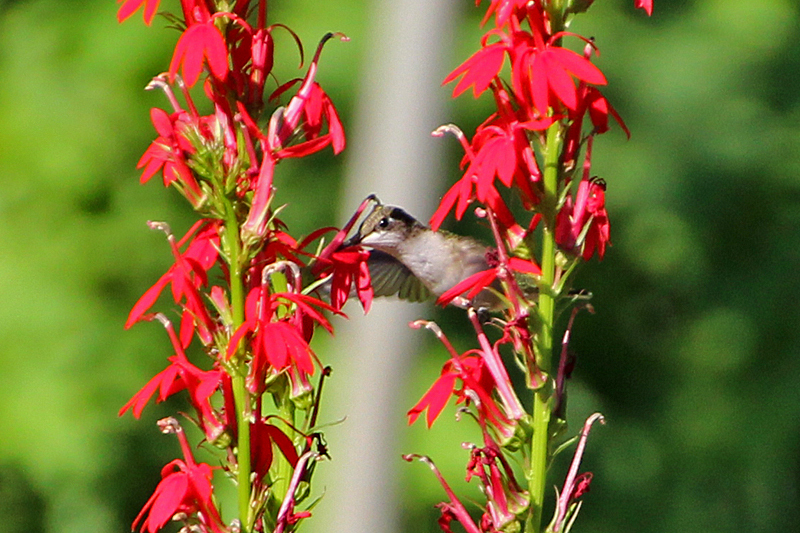 Ruby-throated Hummingbirds are back, just as the Cardinal flower has reached maximum bloom. They actually seem to prefer the flower nectar over the sugar water in the HB feeder. 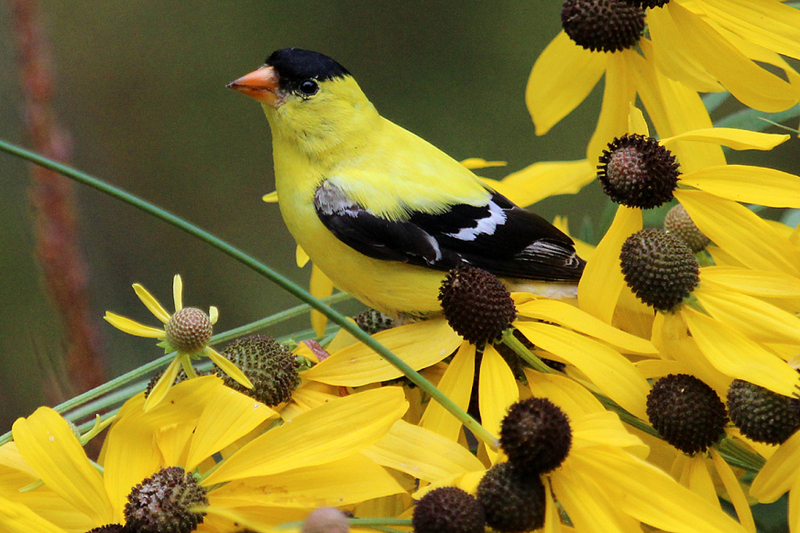 And of course, the Goldfinches are everywhere, picking off the seeds from all the flowerheads. They don’t like the Black-eyed Susan as much as the Cup Plant (above), but any composite flower will do for these guys. 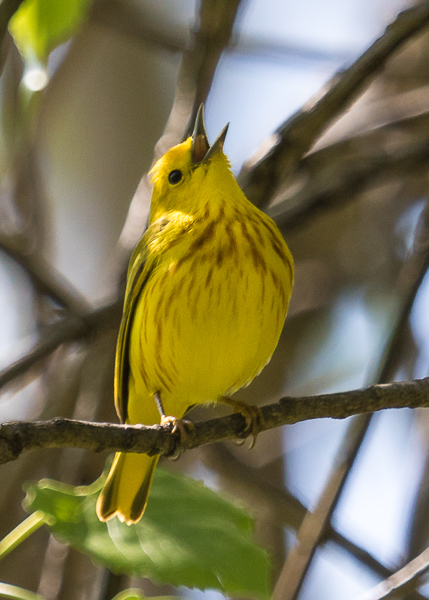 After looking at the hundreds of photos I took over the last few days, I have come to the conclusion that yellow is a very popular color in the bird world. 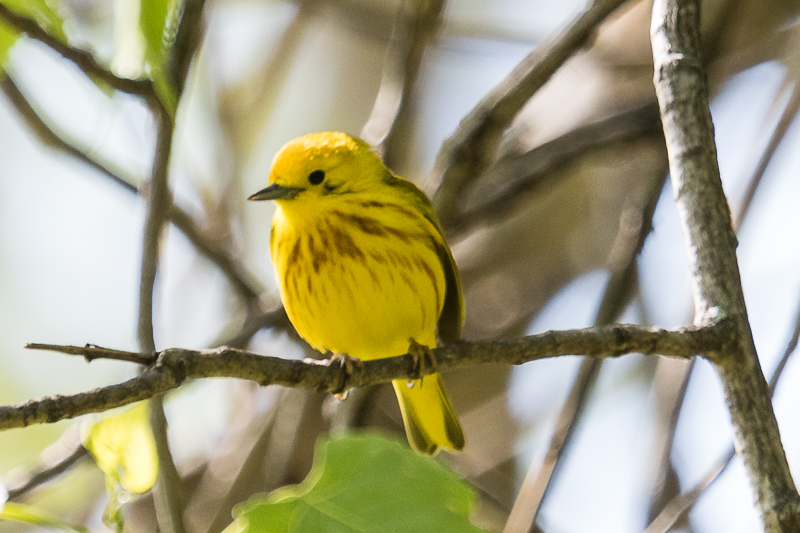 Is this because of the evolutionary relationships of the many yellow warbler species, or is it the availability of carotenoid-containing foods that produce the yellow and red colors in birds, or is yellow simply a highly desirable color in the bird’s eye? A Google search yields no answers. 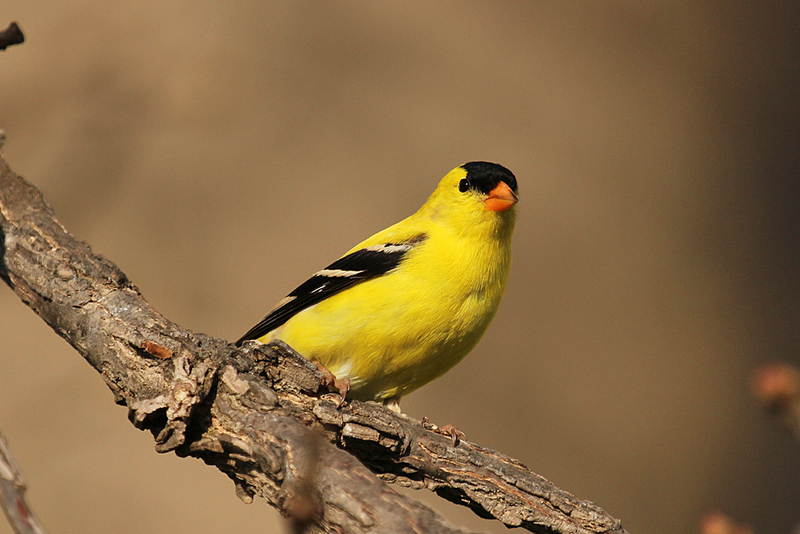 Against a dull background of leafless trees, the American Goldfinch really stands out. 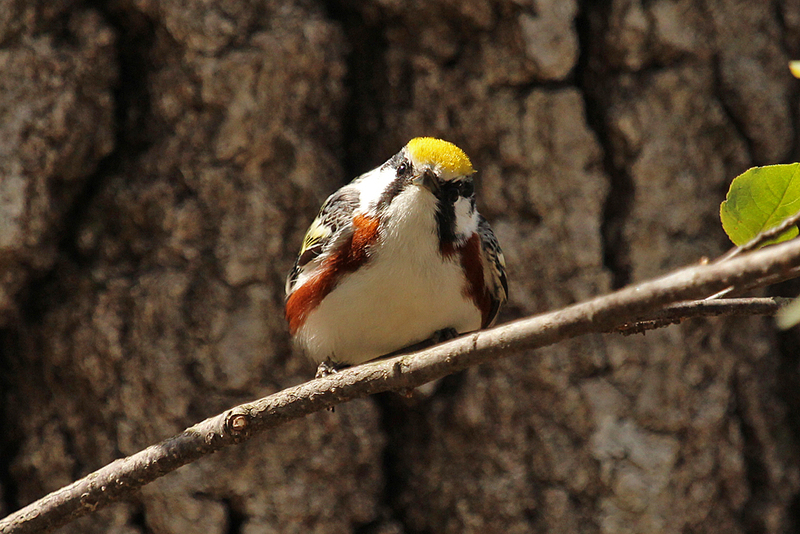 Chestnut-sided Warblers have brilliant golden yellow helmets. 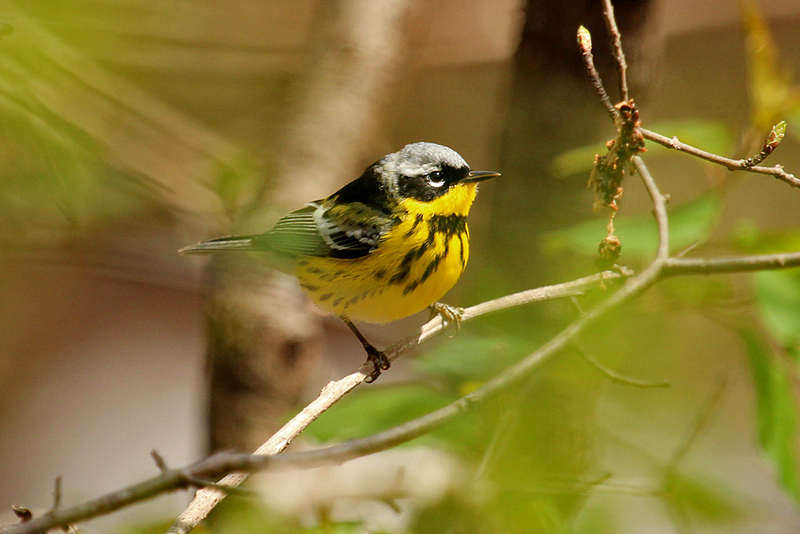 A Magnolia Warbler lights up the green foliage he tries to hide in with his yellow breast. 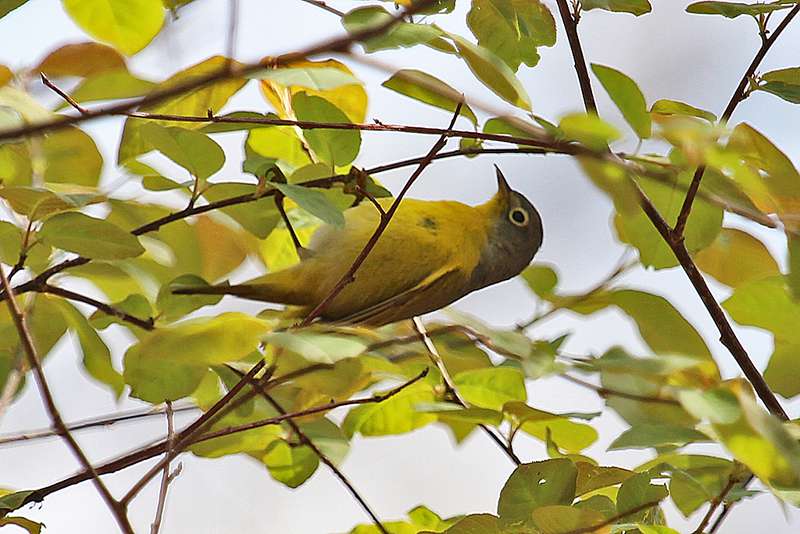 Nashville Warblers comb the underside as well as the topside of the foliage, showing off an entirely yellow breast and belly. 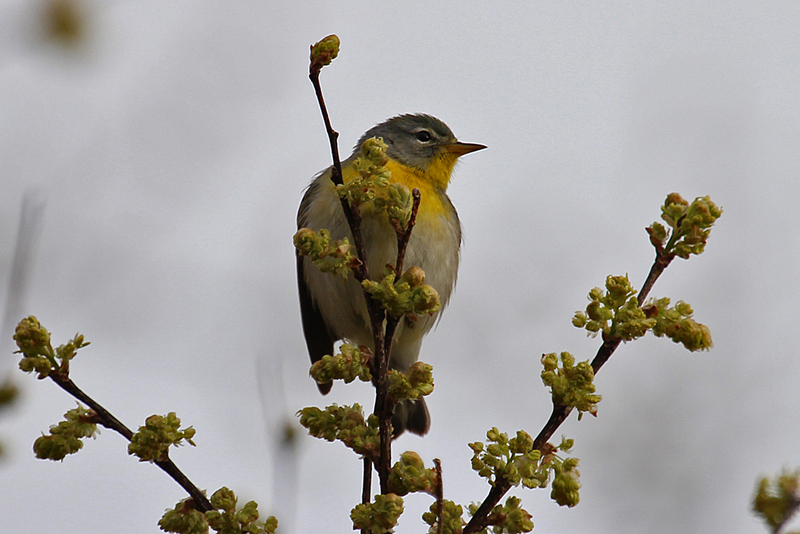 The female Northern Parula Warbler shows off an unusually rich yellow throat color. A very cold little Blue-winged Warbler puffed up his bright yellow feathers to stay warm during these last couple of chilly days. A Yellow-throated Vireo waited sedately on a branch until I took its photo — unlike those pesky warblers that flitted around continuously. 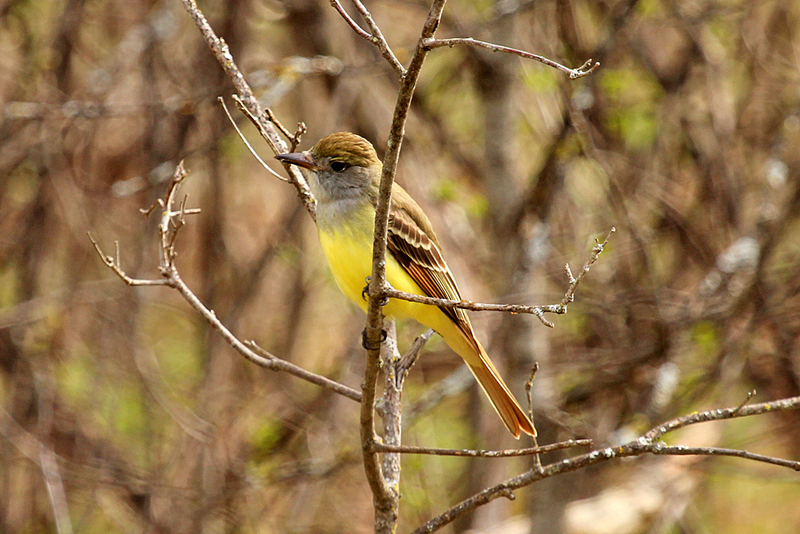 Great Crested Flycatchers are not only larger than most other flycatchers but show off gorgeous lemon yellow bellies.